As we roll into Fall and football season, this has been a busy time of year for your Club. 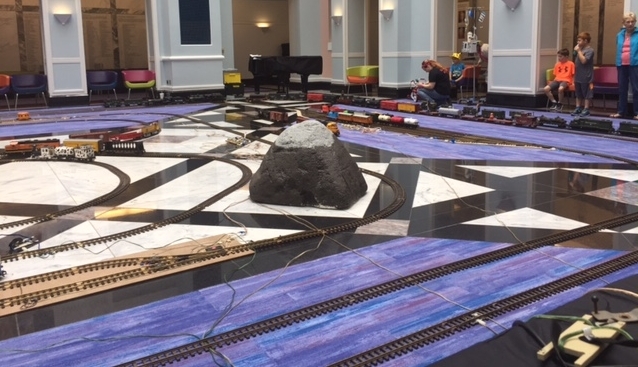 In this month's newsletter, you’ll read about our Cook Children’s Hospital display in Fort Worth in August, our Labor Day weekend show at Clark Gardens in Mineral Wells, and the details about our upcoming Fall Plano Train Show at the end of September. Hello everyone. You will be reading this AFTER our Clark Garden’s display, even though I am writing this the week before we go there. So, I am forecasting that we had a great time (as it is one of the most enjoyable venues that we have, even if their air conditioning never seems to be working). AND since I have no clue who will be there on Friday to set up, Saturday for comradery, and Sunday to tear down, I will just say thanks to those of you that were there. AND thanks to Carol and Max for hosting a great meal for us on Saturday night. What I want to present to you is an answer to some inquiries from our newer members. This is on: what is the proper etiquette for running trains; working to set up and tear down; asking for help with either locomotives and/rolling stock; etc. I hope I can cover it all. For you more experienced club members, please dust off your memories of when you first joined us and how you felt. First of all, if you are new, you may have no idea who people are or their names. So, more experienced members, please remember your name tags, or wear a shirt with your name on it. AND if you see a face that you do not know, or that you do not remember their name from your facial recognition memory, go up to them and say hello. Repeat their name at least eight times in your conversation, and there is a good chance you will remember their name for the next hour or two. I constantly see someone and for the life of me cannot remember their name, so I ask Pete Dahlberg - his memory is sharp as a tack. I also have white spots - if you have not a clue what white spots are, ask Lane Haviland – his white spots have been verified on an MRI. We DO NOT discuss politics, religion, or financial status. WE DO NOT CARE. We love trains. We have that as a common denominator. We love to share our hobby, we want to have people share their love of trains with us and with those who are not yet in the hobby of having model trains. We also do not care if they get into model trains in another scale. 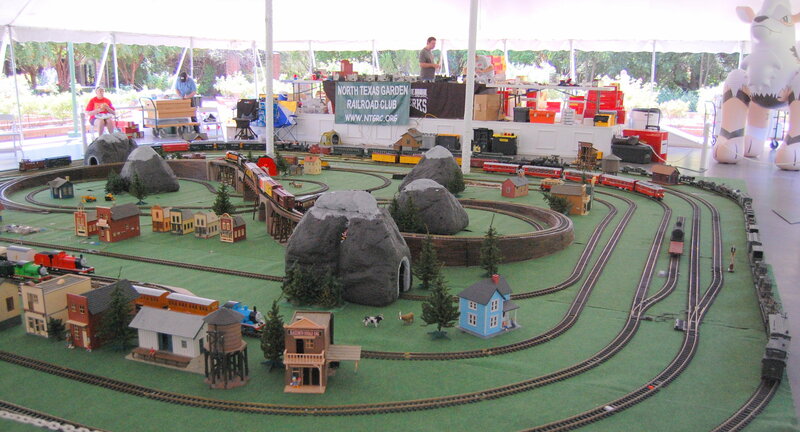 Not everyone is young enough to build an outdoor layout or have that space to do so. So, it might only be a Z scale train in a briefcase or a 7-inch rideable, we want to assist them in the right direction to pursue their dream. We want to share our knowledge of how to do stuff to help others enjoy their trains. Remember, we have people join that have had trains since they were kids, to those like me who join and are totally clueless, since they never had a G Scale train nor any model trains for the last 20 to 30 years, if ever. OK, so now you have joined our group. You have purchased a previously tested locomotive, but have no track at home yet and want to test it. Let someone know and we will find a spot to run your new locomotive (after we have oiled up the moving parts for you). If the type of couplers matches some rolling stock already running we will try to let it pull some cars. If you bring a train (locomotive and rolling stock) we will get you on one of the tracks as soon as possible. Typically, we try to put those trains with the longer cars on the larger loops (that have the larger diameter curves), because they cannot run on the tighter curves. The more rolling stock on a train (the longer the train) the better, as it draws interest of those that come to watch. The board voted to add as large a siding as we can to each loop. (We will be testing this at the Fall Plano show.) 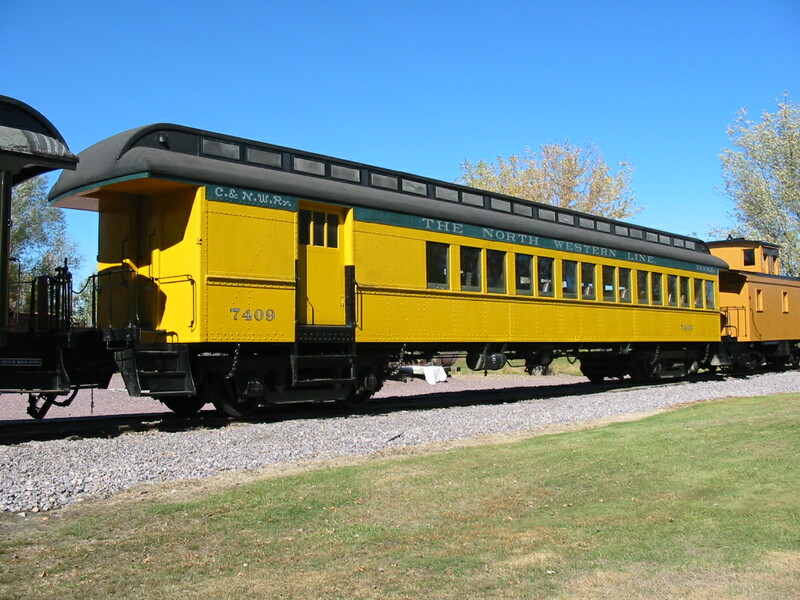 If you bring a long, long train and it does not fit on the siding, you may be asked to reduce the length of the train. The thought is to load the next train onto the siding and get it ready to roll out. Put the train on the loop on the opposite side from the entrance to the siding and then roll the replacement train out onto the loop as the old train moves into the siding. At this point, the train on the siding can remain there or be removed. It will only be removed if there are other members awaiting access to the track. We are adults, even our youngest member, so there is no layout master. We can all work together to ensure each member has track time. Remember, that as a club, our goal is to have interesting movement on our tracks - trains running at all times. We try not to put a train that is very expensive and prone to damage (lots of delicate little detail parts) if it is derailed by a small hand or leg that gets too close, on the outside tracks. We do not want to scare the little ones if that happens. So, if you have one of those just ask to run further away from the outside loops and away from small quick hands and feet. If wanting to run a train, say a freight train behind a diesel locomotive and you only have 2 or 3 cars, ask other members if they have some cars to add to your train. 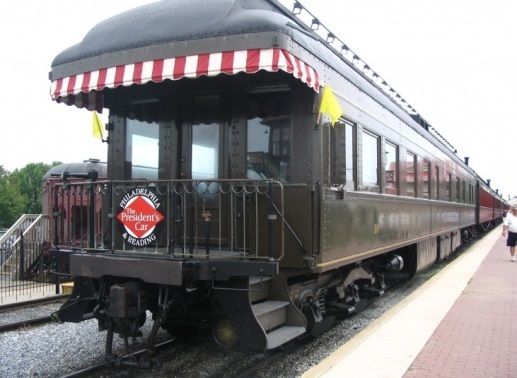 Remember, typically, passenger trains are 5 to 10 cars at most. Narrow gauge steam trains usually pulled 3 to 5 cars, especially in the mountainous regions. Freight trains are typically 10 cars or more, but not always. Freight trains also no longer have only one type of road name on cars in a single train (UP, BNSF, GUMPS, Frisco, D&RGW, Southern Coastal, Virginia Truckee, Norfolk Southern, South Coast, etc. They are now a mix of many road names). I have stopped bringing trains if I know that there will be enough from other club members. I have focused my collection on ATSF and UP Heavyweight and Streamliner cars. Some of you have focused on freight trains. Some on specific types of freight trains, like military or energy (oil cars and coal cars). Others on AMTRAK type passenger trains. Some on the new and old European passenger and freight trains. 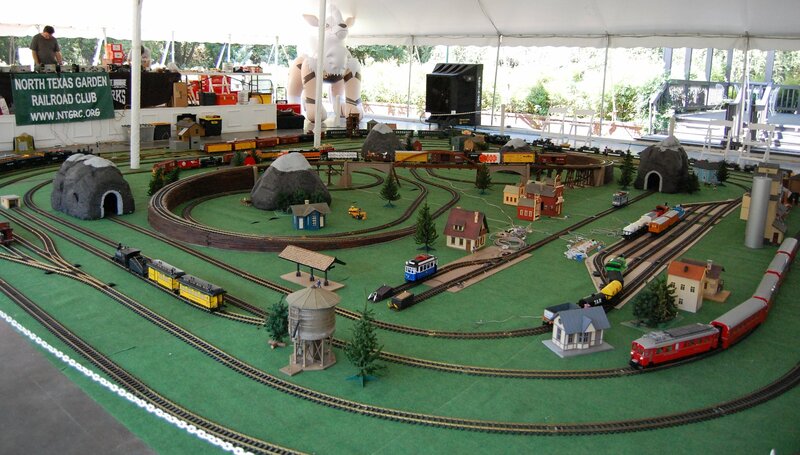 Smaller trains (LGB’s Cow Train, or Snoopy, or the Fortuna Flyer) will likely run on a small 4 ft. diameter curved track, whereas streamliners, heavyweight rolling stock and triple shay, and 4-10-4 type locomotives, will be placed on our 10 to 20 foot diameter tracks. The bottom line is we want you to share your collection with not only other club members, but the public as well. That is what this club is about. Sharing our love of trains with both members and the public AND sparking an interest (whatever it takes to do that) with the public. BECAUSE, without young members like our Johnny (age 16) and Nick (age 15) and Mitch (age 13), our hobby will die out. Many say that G Scale is so expensive that younger folks (10 to 40 years of age) cannot afford it. To that I say nonsense. 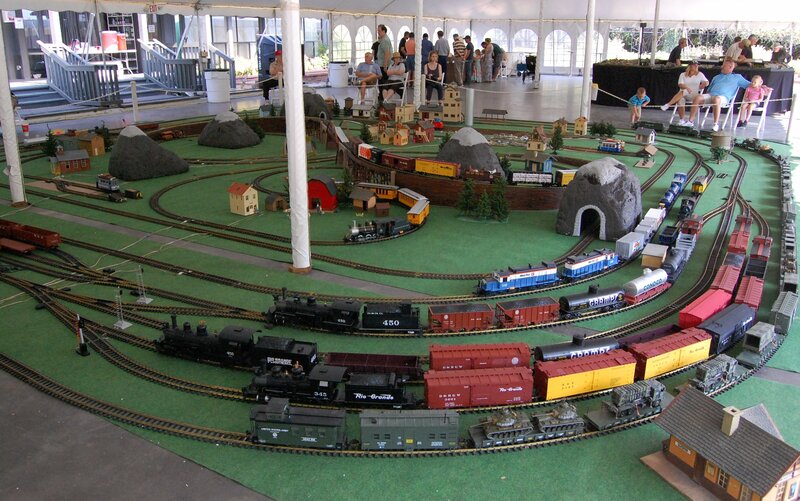 No, it is not as inexpensive as HO scale, but when I see Johnny with his collection, I know if there is a love they will find a way. What I am trying to let you all know is that you are all members and with that comes the sharing of both knowledge and track time. Do not be shy. Let someone know you have brought a train to run. Ask whose trains are running now, find them, and ask if you can use that track. DO NOT be hesitant. Ask. Last, but certainly not least, as we get older (and this applies to even our younger members) we get body problems. We can’t get down or up as easily as we used to. Our knees are shot because we worked last week weeding our garden, or they are just old knees. We may have just had a surgery and cannot lift anything over 5 lbs. You get the idea. Well, grab your walker, scooter, cane, knee pads, or folding chair and come out anyway. If you have put together track you can guide, and direct, and teach. If you bring a train but cannot bend over due to back issues, ask for help. Lots of us will get your train onto the track for you. There are only a few young members and even we have issues from time to time. (Yes, this includes me. I am only 40 years old - I just celebrated my 30th anniversary of my 40th birthday in May. AND Pete is right behind me.) We help each other to further model railroading. IF YOU NEED SOMETHING - ASK !!! I joined this club 6 ½ years ago. I knew nothing. I still do not. But I know that I know enough now to be dangerous. ASK for help. This is your club. It has assistance both at displays and at your home if you have a problem. BUT if we do not know you have a problem, we cannot help you fix it. I will tell you that Pete Dahlberg has forgotten more than I and Lane Haviland together will ever know about model trains. 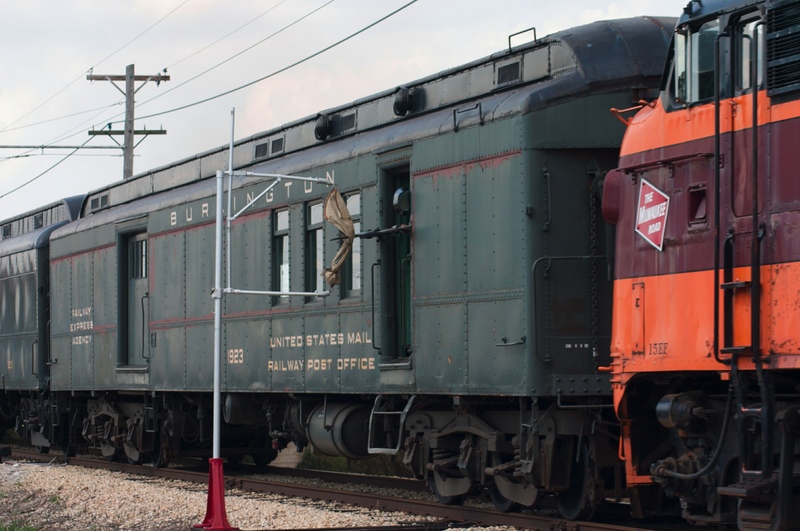 If you have a question about those real trains, both old and new, ask. Check out our 16-year-old Johnny Skiba, or our newest member Ryan Reese, or our board member Steve Lazzari, and/or our 10-year-old (at heart) Mike Pritchett. Reminder: Your 2017 Dues are still only $25.00 for this year (if you pay on or after October 1st, your dues will also include 2018) AND a Life-Time Membership is still only $250.00. Those Life-Time memberships make a wonderful gift. There are still a few members that have not renewed from 2016/2017. September 30th – October 1st Fall Plano Show, set up at 2:00 PM on September 29th. Click here or here for details. There will be a setup worker’s no host dinner at the Bavarian Grill following the set-up (approximately 5:30 PM). November 11th & 12th Texas Western Show, Forest Hill, set up on November 10th time TBA. December 9th Christmas Party, Donna Orr and Roger Shank’s home in Rockwall. Come enjoy the light show at dark. On August 8th, we finished our one-day favorite charity show for the kids at Cook Children’s Hospital in Fort Worth. It is always fulfilling to help take the misery out of their daily lives with running trains. A picture from our Cook’s layout is below. We had a great turnout, so thanks, to all of you who attended including: Tom Lytle, Lane Haviland, Steve Lazzari, Cindy Roerig, Pete Dahlberg, Jerry Raskin, Ron Trees, Bob Milow, Vard Moore, Mike Pritchett, Johnny & Jennifer Skiba, Edi & David St. John, and David Valdez. 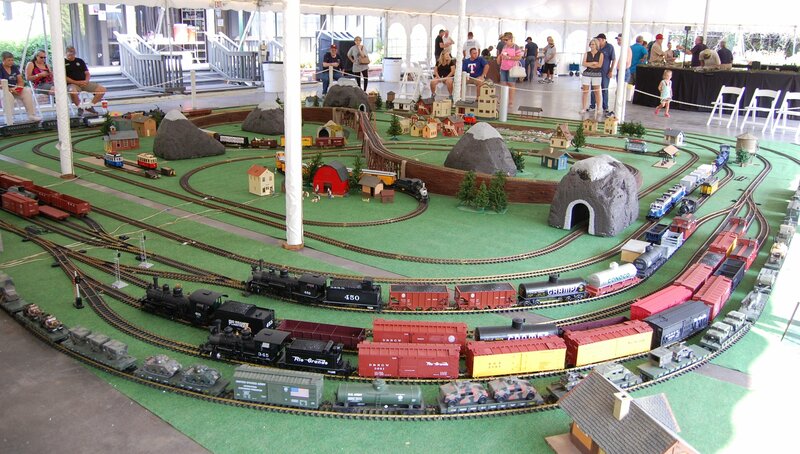 Labor Day weekend was the Clark Gardens train show, and it’s always one of our favorites. We had great weather and a record turnout for the Gardens. Three area model railroad clubs were there, but as always we were the star attraction. I want to thank all who participated as I think it was maybe the best layout presentation we have had to date. The catered dinner Saturday was from the Mesquite Pit Restaurant. The evening in town and the Friday night club dinner at the Restaurant was equally enjoyable. Many of our members brought trains and did run them. Below are a few pictures from our Clark Garden’s show and layout. I would encourage all our members to join us for the Plano show on Saturday and Sunday, September 30th thru October 1st. Click here or here for details. Set up will be on Friday afternoon, September 29th, at 2:00 PM. The Club’s calendar has the July, 2018 home show meeting still open. Please let me know BY EMAIL (lane@haviland.us) if you are interested in hosting this meeting and we will get you on the schedule. Q: What sort of clearance is needed between parallel tracks, both straight and curved? A: This is dependent upon the equipment you are running and the sizes of the curves that are involved. That being said, we can presume that if we size for the largest equipment, then any smaller equipment will work. For straight track I took a 1:20.3 locomotive and measured from the track centerline to the outside edge of the engine. That was 3.5 inches. If we were to set parallel straight tracks at 7” on center, two of these engines would just barely sideswipe. Assuming we would want at least an inch of clearance, then the straight tracks should be at least 8” on center. For curves, we need to calculate the amount of overhang the equipment will have as it goes around the curve. For a given curve size, the longer the equipment, the more overhang there will be. If we look at this problem as a line (equipment length) which is touching a curve (curved track) in two places referred to as a chord, we can use geometry to solve for the amount of overhang. Below is a formula for the length of a chord if you know the radius and the perpendicular distance from the chord to the circle center. This is a simple application of Pythagoras' Theorem. If we presume the biggest piece of equipment that will be used is the USATrains Bi-level auto carrier (37 inches long), then we will get the following results when using the common sectional track dimensions. Note that when using this size car the results are indeterminable for the 4 ft (R1) curve because the car is longer than the curve radius. Although we have values calculated for the overhang, we should remember that this represents the outer edge of the equipment on the outer track and additional space should be added as clearance for the inner track. For those of you who do not have a Bi-level auto carrier, here is the same table but using a car length of 20 inches which probably represents most LGB cars. That's all for our September Newsletter. 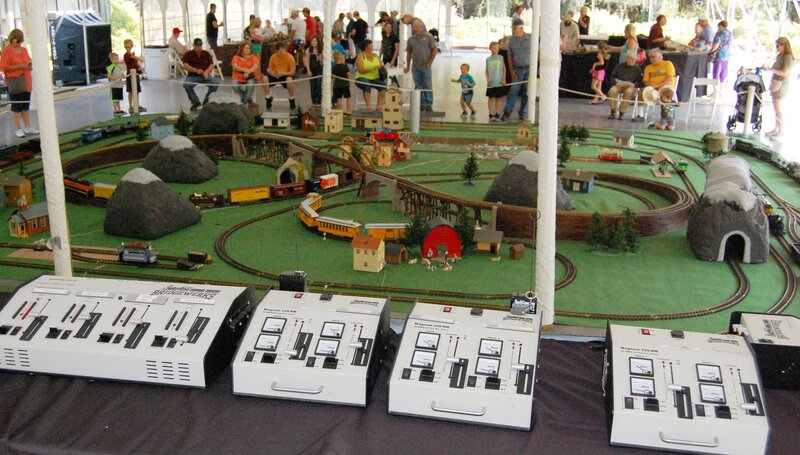 I hope to see many of our members at the Fall Plano Train Show on Saturday and Sunday, September 30th and October 1st. Thanks for reading.